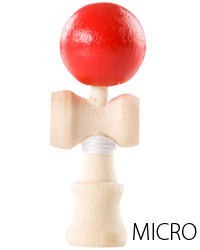 This is the Retro Mini Kendama that is only 3.5cm tall from the ball sitting on top to the bottom of Ken (body). The ball's diameter is only 1.2cm and extremely light making the play super difficult and challenging!! This was recreated version of a super mini Kendama which was once being around some decades ago in Japan. It had not been seen anywhere for so many years that Japan Kendama Association made it for thier 30th Anniversary of the Association's establishment. Junior version is not accepted at a Kendama competition that JKA governs. Weight of Kendama including pacakging is 22g.